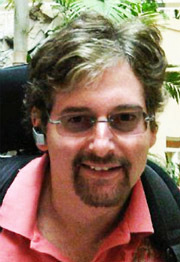 MARK SHEDLIN IN THE U.S.A.
Mark was an airline pilot until he was diagnosed with Multiple Sclerosis in 1994. At first he had trouble walking, then used a cane, then a walker, and as it became worse and he lost control of most of his body, he began using wheelchairs. By 2006 he was severely diminished. He was getting infections and bed sores, was developing lung problems, and his legs had withered to the bone. He needed help getting from bed to the wheelchair and back, and his life had been reduced to a mere handful of very small experiences. He felt he was dying. 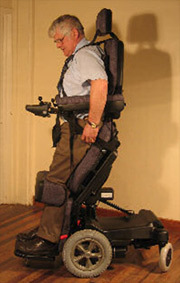 Then he discovered “The Genie Standing Power Chair” built by a little company in the U.K. He ordered one and it changed his life. It allowed him to stand up and talk to people and change his positions when he was uncomfortable. He got the tone back in his legs and the infections and digestion problems went away. It changed his life so much that he spent two years getting the rights for distribution in the U.S.A. so that he could get this affordable, life-changing technology in the hands of the tens of thousands of people suffering from similar disabilities. Click here to watch an interview with Mark. BOB HESTER IN THE U.K.
For many years, Bob Hester, Managing Director of Easycare Products Limited in the U.K., had a vision of positively redefining disability by creating an inter-connecting group of affordable and empowering products. A group of enthusiastic equity investors were recruited to fund the R & D development program in 1997. Three years of continuous ongoing development, finally produced the Genie standing standing wheelchair – the first product module. Its popularity has paved the way to creating a unique head control system enabling severely paralyzed people to control their wheelchairs effectively. These products, and others under development, are exciting new concepts, aimed at improving the quality of life for disabled people worldwide.